Your target customers are elusive. They’re online all day and consume a lot of media, but how do you reach them with your media and your message? Native advertising can be a solution. Jesper covers native advertising in a Content Marketing World session, 5 Killer Cases: How to Grow Your Audience With Native Advertising. In this article, I share how he recommends using native advertising and provide summaries of the case studies. 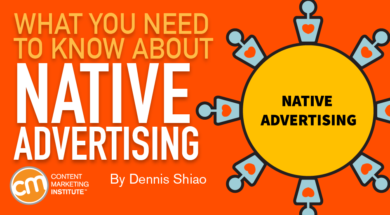 Take a guess – where does native advertising fit best? You probably guessed the “attract” stage where strangers convert to visitors because strangers become visitors when they visit owned media properties (e.g., your website) to read your content. People are aware of your brand and have consumed some of your content. Think of your content as fire and native advertising as gasoline poured on it, Jesper says. Native advertising helps your leads convert to customers and helps turn customers into advocates and promoters. Let’s look at the case studies shared in Jesper’s presentation. Living in damp and moldy homes increases the risk of asthma by 40%. Kids’ bedrooms are often the most polluted in the house. Lack of daylight makes 15% of people sad. Rather than write an article or build a set of web pages, VELUX created a three-minute, well-produced video. The video, produced by an advertising agency, was powerful and impactful, Jesper says. The VELUX team built a content hub around the video with additional facts and research. Jesper says VELUX promoted the content using a range of paid channels, from The New York Times and programmatic advertising to Facebook. “They managed to start a conversation outside of their own platforms,” he notes. For every $1 spent on creating the content, VELUX spent $4 promoting it. The content hub had 500,000 visitors and the video was viewed 88 million times. BNP Paribas, a retail banking company headquartered in France, produced long-form research, the Global Entrepreneur Report: Understanding the Pursuit of Success Among 21st Century Elite Entrepreneurs. The content served the audience, as research showed that once people started reading this report they didn’t stop until the end. The challenge was getting people to start reading it. BNP Paribas found the solution through a native advertising campaign with The New York Times. The final score reflects how far along the quiz taker is on the entrepreneurial journey. Next to it is a button, Download the Report, to drive people to read the Global Entrepreneur Report. While Jesper couldn’t share metrics, he says BNP Paribas was pleased with the campaign and plans to run more of them. The quiz was a nice byproduct of the native advertising campaign. 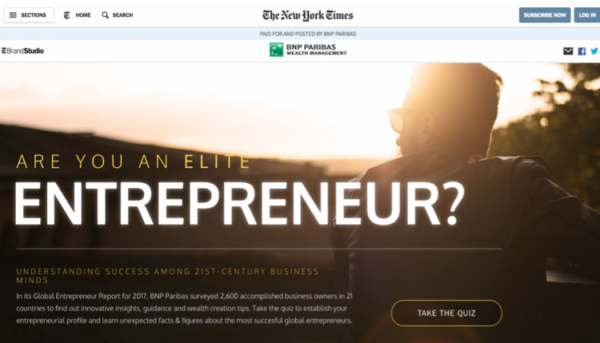 According to Jesper, since BNP Paribas paid for The New York Times content team to develop the quiz, it now owns the content, which it uses on its website. “It’s an extra, added value,” he says. Jesper shares a conversation he had with Tim Clark, head of native advertising at SAP. People asked why SAP built an audience on a third-party site. Tim replied that SAP, which has owned-media properties, opted not to put all its eggs in one owned basket. 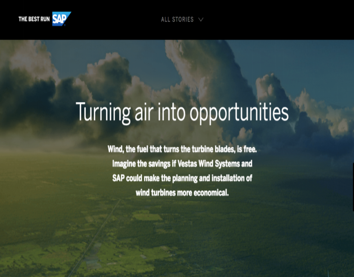 The SAP blog on the Forbes BrandVoice site generates 500,000 unique visitors per month. To get that traffic on SAP sites would be expensive, Tim told Jesper. 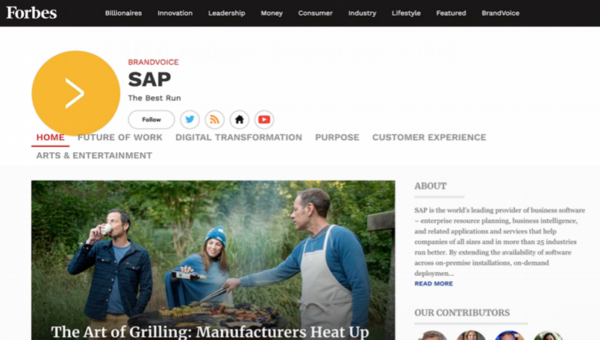 SAP’s efforts are a good example of where native advertising can take known users and move them along the convert and close stages of the sales cycle. Santander, a Spain-based commercial bank and financial services company, launched a campaign for new consumer loans. 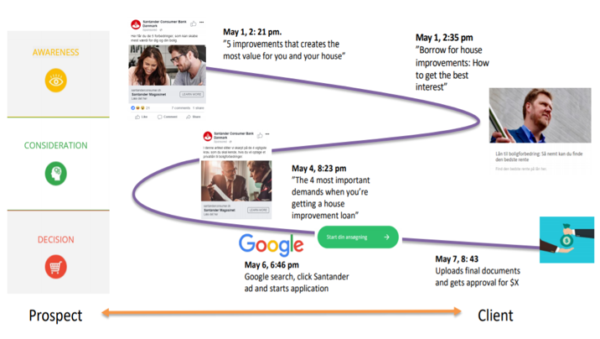 It analyzed the awareness-consideration-decision path of customers and developed native and conventional advertising for that buyer’s journey. Jesper shares the story of a real-life Santander customer, from becoming aware of the brand to applying for a loan. A prospect sees an article shared by Santander on Facebook about how home improvements make a house more valuable. Fourteen minutes later, the prospect reads a related article from Santander about how to get the best interest rates when borrowing for a home improvement project. At that point, Santander drops a cookie on his computer and retargets the prospect with display ads as he visits other sites. Three days later, the prospect clicks on a Santander display ad and reads a Santander article about the four most important demands when getting a home improvement loan. Two days later, the prospect searches on Google and clicks on a Santander search ad, arriving at a Santander page where he starts a loan application. One day later, the new customer uploads his final documents and receives approval for his loan. As a reader of this site, you’re well versed in the theory and practice of content marketing. Congratulations, you’re well on your way to native advertising. In both cases, you need to tell engaging stories that capture the attention and satisfaction of your target audience. With content marketing, those stories are found on your owned media properties. With native advertising, you pay vendors to distribute your stories across channels they own and manage. With your understanding of native advertising, your next step is to research the native advertising vendors in your industry. Learn about their offerings and pricing. Then, use existing content to run a native advertising campaign. You may connect with a universe of readers whom you otherwise would have missed. Use the comments to share your experiences with native advertising. Join expert presenters (and thousands of your fellow content marketers) and up your brand’s content marketing game. Register today for Content Marketing World this September. Use code BLOG 100 to save $100.